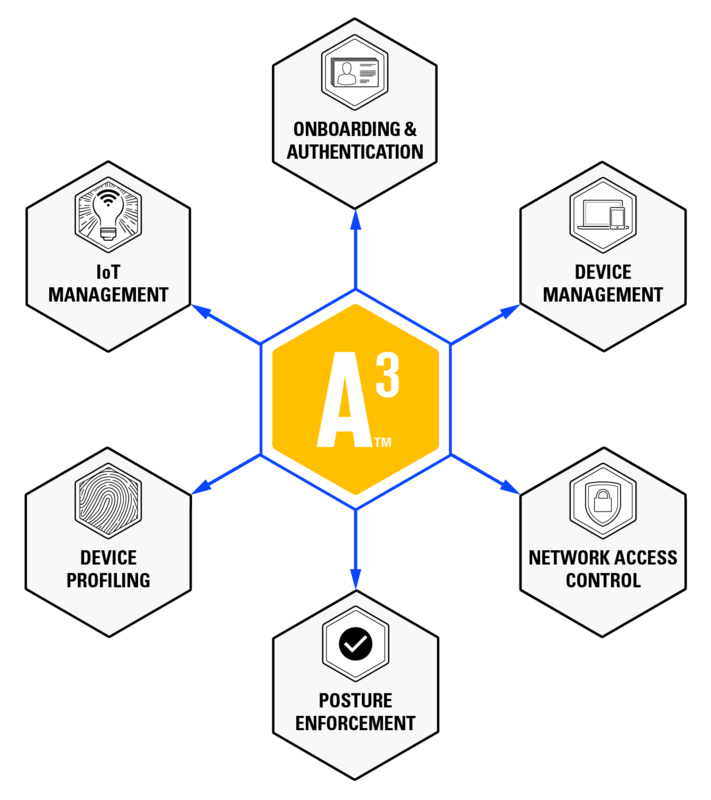 A3 provides enterprise-grade functionality for securing, managing and controlling all devices on your access network – from standard wired and wireless clients, to IoT and BYOD. Its industry-first cloud-management option enables unprecedented levels of deployment efficiency and flexibility. Combined with streamlined, UI-based workflows and a complete feature set for device onboarding, client visibility, profiling, policy and compliance enforcement, A3 presents a new and highly effective approach for securing today’s access networks. The access network presents a multitude of IT security challenges. An ever-growing number of corporate and guest devices, as well as IoT and BYOD, need to be securely on-boarded and provisioned with the access rights appropriate for their roles. Once authenticated onto the network, network policies need to be enforced and dynamically adjusted to prevent unauthorized access and breaches. And even properly authenticated devices with well-defined network policies continue to pose security risks due to malware and compromised 3rd party applications they may accumulate over time. IT security departments need to be able address these challenges, with a complete and highly effective toolset for access management and control. A3 provides complete functionality for secure access management, and integrates seamlessly with customers’ existing IT security infrastructure, including all best-of-breed firewalls, MDM/Endpoint Security systems, Intrusion Detection Systems and Posture Assessment solutions.